Time flies, el tiempo vuela. 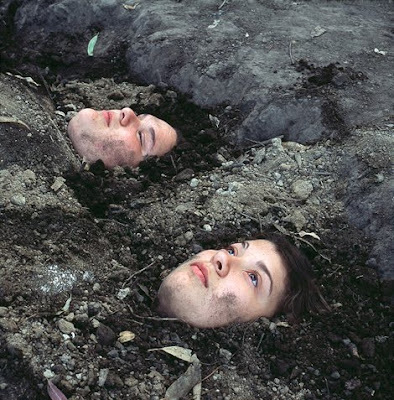 I watch the photo of the young girls buried in the soil of the Argentinean Pampas. Belinda with eyes wide open, the sky above reflected in her eyes. Guillermina, eyes almost closed - her mind is somewhere else. It is probably my favourite picture from the exhibition by photographer Alessandra Sanguinetti opening today in Kulturhuset, Stockholm. I was given the opportunity to have a brief conversation with Alessandra the other day. We sat down in the gallery surrounded by her beautiful colour photographs. They are generous in size and of an excellent quality. 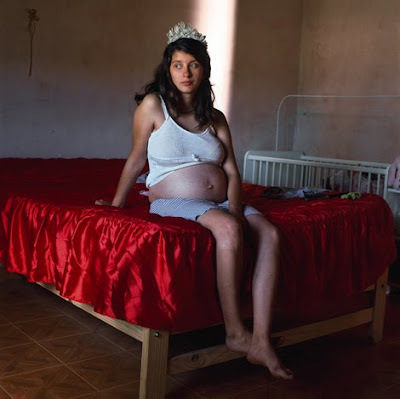 The producers have done a great job and I really like how the work of Alessandra Sanguinetti is displayed. Trying to be a bit rational and effective, I had prepared some questions in advance. But soon our conversation turned in to a mix of quite free associations and I suddenly found us talking about Mercedes Sosa and T.S. Eliot (Alessandra tells me that she listened a lot to Mercedes when working with this project and also to recordings of T.S. Eliot proclaiming his poems). The story of Belinda and Guillermina is linked to the story of Alessandra herself. Her father is Argentinean and he had a farm outside Buenos Aires where Alessandra first met the two girls (they are cousins). 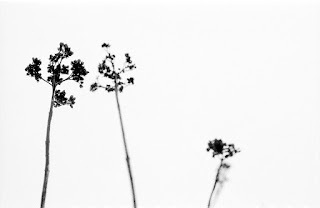 She started to photograph them, fascinated by their friendship. It was in 1999 and she continued for ten yours covering a period where she watched the girls growing up turning into young women - and Belinda even giving birth to her own child. Alessandra tells me about the photo sessions with the girls - the pictures are all a result of simple ideas, sometimes inspired from pictures they had seen in popular magazines or as with "Ophelias" from the Shakespeare tragedy, Hamlet; "When down her weedy trophies and herself Fell in the weeping brook. Her clothes spread wide; And, mermaid-like, awhile they bore her up"
Belinda and Guillermina were very enthusiastic about the "Ophelias" - it was an idea that triggered their imagination. I get a sense of Alessandra's involment in the process of making the pictures and to me she is like the third woman or girl in this story. Her series is indeed about friendship, about three people creating something important together. One of them happened to be a photographer. Alessandra tells me that she used her old Hasselblad camera for all of the photos - she is superstitious about technology and if she has got something that works - why change it? The prints hanging in the gallery are of brilliant quality with colour tones that makes me think of Nickolas Muray, so I think she has got a point. I highly recommend you to go and see the exhibition - it is quite different from the kind of (generally speaking) rationalism that you will find in a place like Sweden. 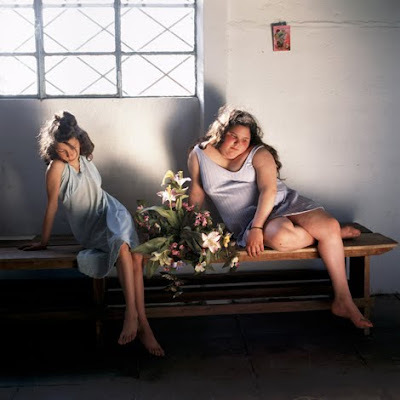 There is plenty of room for imagination, dreams and magic in the work of Alessandra Sanguinetti. I like the way Alessandra works. So sensitive and close to the subject. There is plenty of magic in her images! I've followed this series for years. So intriguing. This is a very special story !!! This photos are deep and magics. Great work ... great photographer! Wonderful exhibition! I still remember it! 25 books - "Fotografie ist unsere Leidenschaft"